EU citizenship has a serious democratic deficit and this is the lack of minimum standards for the rules of acquisition and loss of Member State nationality, from which EU citizenship is derived. Dora proposes to guarantee maintenance of EU citizenship in case of involuntary loss of Member State nationality and to provide independent access to EU citizenship on grounds of birth or long-term residence in EU territory. This might considerably worsen the conditions for addressing the democratic deficit. Member States would argue that their policies of deprivation or exclusion are no longer of any concern to the other Member States and the EU institutions if these policies do not determine who is a EU citizen because alternative routes to that status are provided by the EU itself. Once Member State nationality has been disconnected from EU citizenship, nationalist governments would not only gain further leeway for illiberal citizenship policies; they would also be provided with new scapegoats: ‘rootless’ EU citizens whose rights are not grounded in their belonging to a Member States of the Union, but are imposed by “Brussels” as a restriction on national sovereignty. A further problem with Kostakopoulou’s proposal is that it creates two classes of EU citizens: those who possess the nationality of a Member State and those who don’t. The latter could include most immigrants from third countries and their children born in the EU, whose incentives for naturalisation would be as low as they currently are for EU citizens residing in other Member States. These “independent Eurozens” could only vote in local and EP elections but would be excluded from participating in the domestic politics of the country where they have settled for good. They would also not be equally represented in EU legislation since they cannot vote for the governments that sit in the Council of the EU. I share Richard Bellamy’s general objections against Kostakopoulou’s approach. In federal democracies or unions of democratic states, such as the EU, citizenship at one level must be derived from citizenship at the other level. The reason for this is that the two levels of government are constitutionally intertwined. In a federal state, the derivation is downwards: the citizens of the federation are also citizens of the federated provinces, states, regions or cantons. In a union of states, the derivation is upwards: the citizens of the Member States are also citizens of the Union. This is not a general feature of multilevel democracy. For example, citizenship at the local level is not necessarily derived from national citizenship. EU law provides mobile EU citizens with voting rights in local elections, but not in provincial or national ones. And 12 EU states grant municipal voting rights to third country nationals, creating thereby precisely the kind of residence-based citizenship at local level that Kostakopoulou wants to have at supranational level. But why can and should local citizenship be disconnected from national citizenship, while Union citizenship must stay connected? The reason is that federations and unions consist of potentially independent polities that have agreed to become interdependent by pooling their sovereignty. They form composite polities entangled in a constitutive relation with their members that does not exist between states and municipalities. In democratic federations and unions, the higher level of government represents citizens both directly (through federal or supranational parliaments) and indirectly (through legislative bodies representing the constitutive polities, such as the EU Council or territorial chambers of federal parliaments). Equality of political citizenship and democratic legitimacy in such composite polities requires that each citizen at one level must also be a citizen at the other level. If either the higher or lower level government can produce its own citizens that are not recognized as citizens at the other level, the construction becomes dangerously unhinged. The upshot of my argument is, first, that citizenship rights cannot be so easily disconnected from citizenship as a status of full and equal membership and, second, that we need to consider carefully the constitutive features of membership in a particular type of polity. Much liberal thinking about citizenship suffers from a “ius-ex-machina” delusion by forgetting how rights must be generated through democratic institutions that themselves need to be seen as legitimate by their citizens. This does not rule out extending rights beyond citizenship status. Liberal democratic states and the EU itself grant long-term resident third country nationals a status of quasi-citizenship that entails equality with full citizens with regard to most rights apart from those of participation in national and EU elections and unconditional rights of return to the territory and diplomatic protection abroad. Such an unbundling of citizenship and rights is fully compatible with retaining the link between national and EU citizenship status and the core right of political participation entailed by it. A similar response has been found for Brexit. Current UK citizens in the EU and EU citizens in Britain will retain their quasi-citizenship rights of residence, employment and non-discrimination in social welfare, but they will no longer have the previous status of membership. This is what is required in order to make the collective right to exit from a voluntary union of states meaningful. If UK citizens could retain EU citizenship after their country has left the Union and is no longer involved in making EU law, they could also vote in EP elections and authorize thereby legislation that does not apply to their country. While my argument largely agrees with Bellamy’s critique, I am not sure he will share my conclusion. It is precisely because the two levels of citizenship are linked that EU Member States should reform their nationality laws in order to bring them in line with liberal and democratic standards. As a union of liberal democratic states, the EU must maintain the rule of law and democratic standards of free and fair elections that are currently jeopardized in some Member States. For the same reasons, such a union cannot tolerate either that Member States abuse their exclusive powers to determine their own nationals by arbitrarily depriving nationals of their citizenship, by excluding long-term residents from access to naturalisation, by passing on their citizenship to successive generations born abroad without any tie to their ancestors’ country of origin, or by selling it to investors looking for a tax haven. State sovereignty allows them to do much of this without violating international law. But pooled sovereignty in the EU is not compatible with such wide leeway for states to determine their own nationals since they produce EU citizens that all other Member States must accept not merely as residents and workers but also as participants in the collective self-government of the Union. 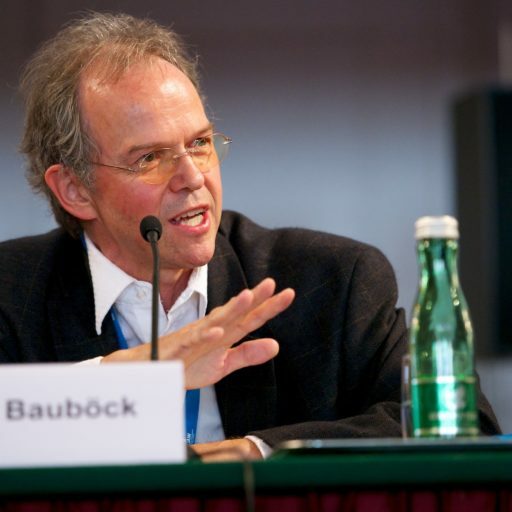 SUGGESTED CITATION Bauböck, Rainer: If You Want to Make EU Citizenship More Inclusive You Have to Reform Nationality Laws, VerfBlog, 2019/1/21, https://verfassungsblog.de/if-you-want-to-make-eu-citizenship-more-inclusive-you-have-to-reform-nationality-laws/, DOI: https://doi.org/10.17176/20190211-221156-0.